And, of course, we cannot forget a coast guard version! Coast Guard version needs wheels. Well I see one stupid idea right out of the gate. why are the mk38s behind a door? Another stupid and pointless automated system that will require maintenance. What are the dimensions? I bet this would need a few more people than 100 for damage control efforts. if it’s all existing systems why is the crewing less than 1/3 of an AB? Is it 1/3 of the size? The Mk38 25mm gun is under the rear deck floor for two reasons... (1) So you don't have a hazard on the end of the flight deck except when it is in use. (2) a door and an elevating platform is municipal bus technology and it keeps the gun out of the weather reducing maintenance requirements. The Mk32 324mm torpedo tubes are covered up for the same reason. The tubes are located in the same contiguous space as the helicopter hangar. The doors keep the area dry and away from the salt spray except when you are actually dropping a torpedo into the water. In which case, it is as complicated and as fast to operate as a pneumatic door on a bus. Last time i checked the Zumwalt had 300 or so, but again that’s too few especially in a combat/DC situation. you clearly don’t know how the navy’s 3M system works. The system will have the same weekly and monthly maintenance checks regardless of what class it’s on, the platform and door just add more maintenance, same for the torpedoes. but at 498ft you’re about 8ft shorter than an AB and only about 14.1ft narrower...simply put 100 sailors can operate the weapons systems and do damage control effectively. This has about the same as a Lafayette/Kangding/Formidable class Frigate. 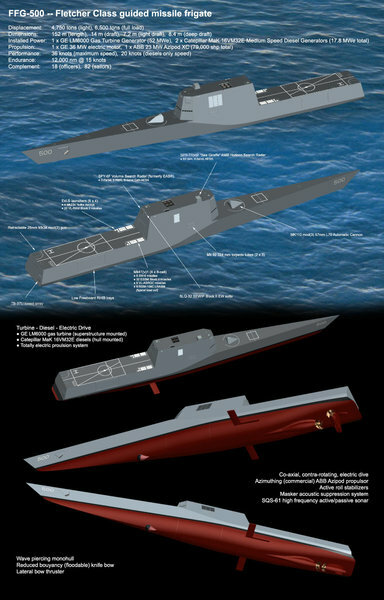 The Zumwalt has a complement of 140. A ship being larger or smaller has very little to do with how many crews it needs. Crews are a big liability, not just because they need to be trained and paid making up a significant portion of the operating cost of any warship. Crews also need to be fed and taken care of. Fuel aside, reducing the crew size to 1/3 that which is typical of US destroyers essentially triples the endurance of the vessel from a logistical standpoint. Crews also get in the way of the most effective and fastest remedies to battle damage -- gaseous fire suppressants, chemical sealants and immediate sealing off of flooding compartments all of which are basically a death penalty for any human in the affected area. Size has a lot to do with crew needed. a single attack team for fire fighting is 9 people at minimum almost 1/10 of the crew, the Zumwalt has been 100% an abject failure and doesn’t justify anything. Jesus have you ever actually been on an active warship? what happens when your fire fighting foam or gas system fails? Who does paint and preservation during normal operations of a ship that big? you want to man a bridge crew, CIC, CMSC, CCS, aft steering, and at least two DC lockers more likely 3 lockers with 100 people? Not to mention sailors in deep mag eventually someone will need to put more rounds in the hoist. at 100 people under ideal conditions it can work but even when training you won’t have ideal conditions let alone in combat. to be honest shops often find themselves short handed because they’re rarely at full manning. You sink and die! What happened when your human intenstive (read SLOW) damage control doctrine fails? You sink and die. The same people as does the paint and preservation on a Natural Gas carrier or container ship -- the SHIPYARD WORKERS when you go in for a scheduled overhaul! Same goes for when automation fails. Actually, a modern ship like this can be sailed, maneurvered, detect the enemy and fire its weapons at their full capacity with a crew of about 8 or 10 (minimum) basically whoever's in the CIC. Everyone else are there for the day to day mundane stuff. And 100 is not all that few. A modern 80,000 ton merchant ship frequently operate on a crew of about 20~30. It's a choice. The same kind of choice that was made when we went from Des Moines class cruiser with a crew of about 1800 to a Ticonderoga with about 350 to a Zumwalt with about 140. The point here is that manpower is not the only way to conduct damage control or operate a ship. And, more importantly, sometimes you really cannot have both and function properly. If your strategy is sealing off compartments in seconds and flooding it with poisonous gases. You really do not want crew members everywhere on the ship. If the system is built around very quickly counter flooding compartments you also do not want living things in most parts of the ship. If your plan is to actually have ZERO personel on deck for watch duties and rely entirely on electro-optics, you don;t really need the crew to stand at those stations. And merchant ships don’t have nearly as strict of requirements or high of demand. They’re at sea for a week or two at most normally. ive been in CIC. I’ve been on the bridge. ive been on a gun system, I’ve driven the ship. again you’re ridiculously out of your depth. try learning the realities of what you’re talking about. 10 people in CIC, 3 on the bridge, 3 in CCS, 1 in CSMC and 3 in the galley. they can’t be on watch 24/7 so you need at least two watch sections, so that sounds 40 right there and you’re not going to get much maintenance, paint and pres, drilling, or training done like that. Actually, if you are only going to fire the 20 rounds in the automatic loader it can be a totally unmanned system. For 95% of the engagements, that is enough. For others, OK, so you have a guy or two top off the ready magazine. Again, you are entitled to you opinion, but modern warships with about a third as many sailors as a Burke is a reality today. Because sealing a compartment is best...just let the compartment flood instead of patching or plugging the hole and begin dewatering...because only one compartment would ever get a hole in it. again you’re ridiculously out of touch. The Zumwalt was an utter failure. the LCSes are having issues with manning with stories of the big three being required to do things typically up to jr sailors rather than doing their actual jobs of running the ship. the Des Moines class had man power intensive systems compared to the ticos. Way to skip forward 30+ years and skip over ships like the Long Beach that has 1100+ crew. Or the Albany class. technology hasn’t advanced that far that we’re going from 325 sailors on the ABs to 140 on the failures that are the zumwalts. As far as the bridge goes, manning it is really optional. It may be used when getting in and our of port and for hosting a pilot docking purposes... otherwise. The entire ship can be sailed and fought with from the CIC. 360 degrees of Electro-optics coverage brings color and infrared imagery with automatic moving object tracking to monitors in the CIC. The computer scans the seascape and tracks unusual activity. A few guys on monitors can zoom in and look at stuff of interest. A press of a button toggles between IR and CCTV. Another button ranges the target with a laser and correlates it with a radar track. Nobody needs to be topside with a binoculars. And if you were, you wouldn't be able to see as much or as far or in as great a detail. They might exist doesn’t mean it’s a good idea. theres a reason why our sailors are over extended and exhausted. It’s people like you. 20 rds is enough? That’s rich. iran has boats that carry like 12 125mm rockets 2 boats and you’re out of ammo, with 2 inbound rockets going unmolested, 4 barrels of 23mm spitting hundreds of rounds at your more or less defenseless ship. 2 of the boats pictured at the top of the page can overwhelm your ship’s defenses. 6 would likely maul and kill most of your 100 man crew. 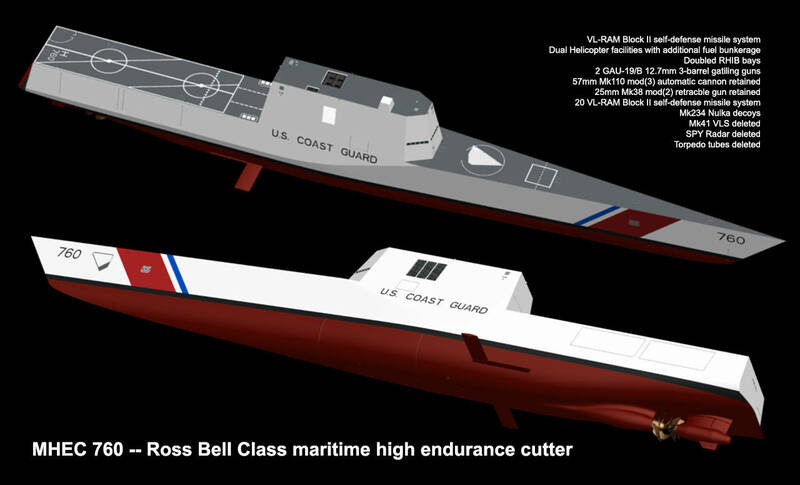 soooo you’re asking the USN to completely change their policy in order to adopt this ship. There is a reason why the OOD is always on the bridge when possible. Those optics and sensors can be knocked out which means you need physical men/women to keep an eye on the horizon. We already recently had a ship collision due to relying on such systems and there is a reason why surface vessel's need eyes on the water. High-tech is susceptible to being knocked out from shock and EMP. The Mark 1 Eyeball isn't. Low-tech weapons/hardware are always needed as a back up. Also, as for the Bino's, have you seen how far the "Big Eyes" can see? The Mk3's have 20x power with a 70 degree field of view and are designed to be water and fog proof as well as condensation proof. That's a 20x zoom factor. There is a reason why on all ships you have lookout's posted around the vessel. With the ship at the top, I personally think you want at least 220 Sailors and 16 Marines for a total of 236 personnel on it for optimal rotation.